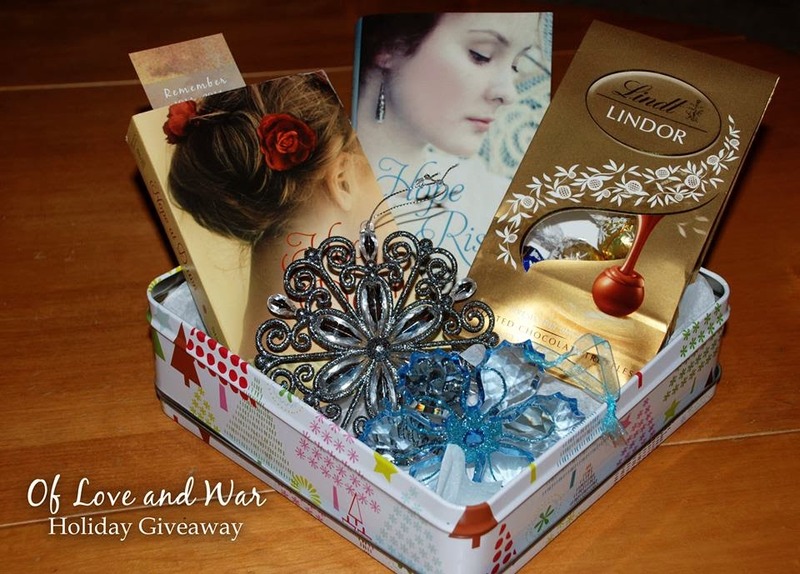 To celebrate the holidays and HOPE RISING's release next week from Forever Romance, author Stacy Henrie is giving away an Of Love and War holiday gift basket! Win a signed copy of HOPE AT DAWN (Book 1), a signed copy of HOPE RISING (Book 2), Lindor chocolates, a red poppy bookmark, and two vintage style tree ornaments. To enter, tell her in the comments on her Facebook page if you have a real or a fake Christmas tree this year (hers=fake). Open to U.S. and Canadian residents only. Comment MUST be on her Facebook page! Giveaway ends Tuesday, December 16th at 5:00 a.m. (MST). She will select one random winner and announce it on her Facebook page that day! I entered this gorgeous giveaway on Facebook as instructed. Since we now live in southwest Florida, an artificial tree is the only way to go. When we lived in Virginia, we had a live tree for several years but it's so heartbreaking to see those beautiful left outside, dying and waiting for refuse pickup.